I can’t decide if this post is too late for mother’s day post or too early for father’s day. My mother was both for most of our lives, so it’s kind of perfect that it falls somewhere in between. The first comment people made when I told them I was moving to Miami was that my mother must be thrilled. I love telling people that her initial reaction was a momentary pause, a sigh, and to say – well, I’ll need my space. Full disclosure – she denies saying this but then she laughs because she knows it’s true. Far from offended, I was relieved. I’d had it in my mind for the last few years that my mother was secretly suffering because both my sister and I lived in another city. I was convinced that at the end of every trip home, she was putting on her best Stella Dallas face as she dropped me off at the airport while secretly hoping I’d stay. As it turned out, she did want us to come home – but with reservations. It was almost impossible to imagine that would one day be the case when I left. Not only was my older sister also leaving to start a conservatory program in New York, but our two closest friends were coming too. The plan was for my sister to fly ahead to start the apartment search and the rest of us would follow in a rented U-Haul. Our families saw us off and there was something poignant about the pictures we took that morning. While my friends and I had tear stained faces from saying goodbye, we also beamed with excitement. Our mothers smiled bravely while looking quietly devastated. My own mother cried the hardest. But she is someone who makes the best of any situation. She made it up to New York pretty often – including a surprise visit during my first semester at college when I was feeling wobbly. But when she was in Miami, she was always out and about. As the city grew up, Ali kept up. During our trips home, she’d take us to a pan con lechón spot she’d found, a new hipster wine bar, or a micro-theater run out a shipping container she’d heard about. My mother is always game and it’s a quality I’ve take full advantage of since coming home. Whatever I’m looking for, I just have to ask Ali. So when she told me what she wanted for mother’s day brunch was hot dogs and a day by the pool, I knew to listen. She’d stopped by for dinner and was flipping through Pati Jinich’s Mexican Today when she spotted Jinich’s hot dogs with chicharrón, avocado, and queso fresco recipe. After spending the morning picking up ingredients, we spent the day together doing exactly what she wanted – hot dogs, pool, and Julio Iglesias on Pandora. We all had our space but had never been closer. I interviewed Pati around the book’s release and have hardly put it away since. 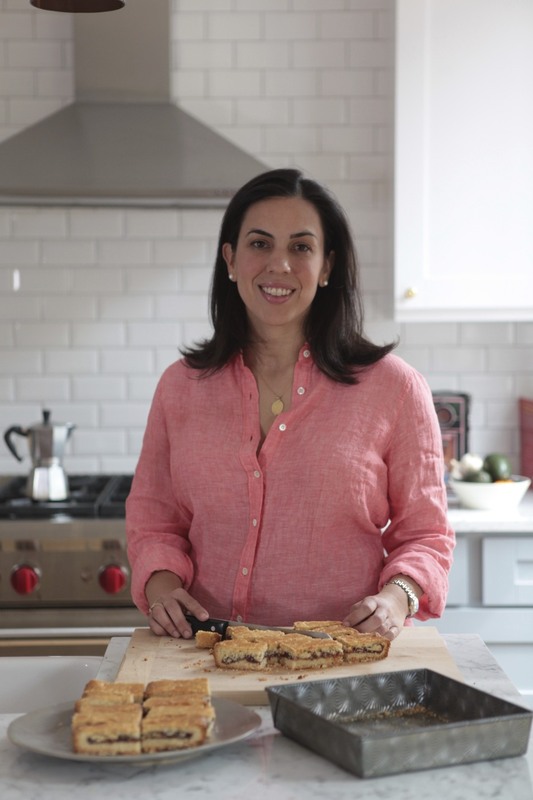 She points out that while people are always talking about Americanized Mexican food, the reverse is also true. If these hot dogs are any indication, American food would benefit from Mexicanization, lots of it. permission of Rux Martin Books/HoughtonMifflin Harcourt. All rights reserved. Cook the hot dogs and keep warm. Heat the oil in large skillet over medium heat. Once hot, add the scallions, jalapeño, corn, and ¼ teaspoon of the salt, and cook for about 1 minute, stirring frequently, just until the vegetables have seared and softened slightly. Transfer to a bowl. Add the lime juice, jalapeño brine, avocado, and remaining ½ teaspoon salt to the bowl and mix everything together. Just before assembling the hot dogs, add the chicharrón pieces to the bowl and toss well. Open up the hot dog buns but try to keep them intact and heat in the oven or toaster oven. 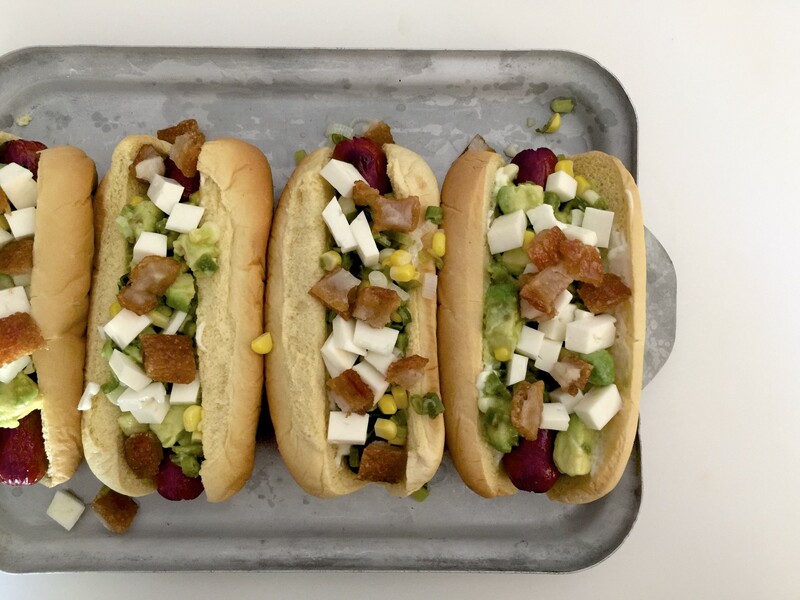 Spread mayonnaise on the bottom half of each bun, place the hot dogs on top and spoon on a generous amount of the avocado, corn, and chicharron mix. Top with crumbled queso fresco and serve. I love the story of your Mother. Great post! Oh how delicious and interesting! Great for summer picnics. Love your blog, but this is NOT Mexican or Mexican-American food.